Some franchises should know when to quit. 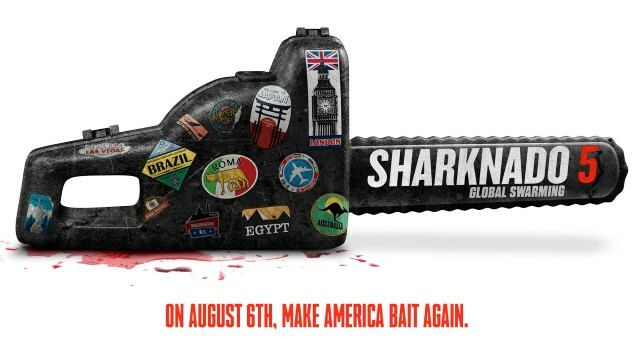 Sharknado isn’t one of them and this summer returns with its fifth instalment. Theme parks, Las Vegas, pirates, politics and even reaching as far as space, the creature feature may have extended it’s one trick pony beyond recognition but it may have a few tricks left up it’s sleeve when it arrives on screens this August. The film’s title and tagline prove once again that the series isn’t going to take itself too seriously. Yes, when the series may have hit some of the US’s top destinations, things are going global with the help of a few familiar (and unsuspecting) friends. Starring Pro Skater Tony Hawk, Pop Idol Clay Aiken, GREASE star Olivia Newton-John, Poison frontman Bret Michaels, GAME OF THRONES actor Ross Mullan and reality star Charo as our very own Queen of England. And did we mention DEATH BECOMES HER and SPY HARD heart throb Fabio Lanzoni is playing the Pope? All this topped off with a returning cast of Tara Reid, Ian Ziering and SHARKNADO 4 sensation Gilbert Gottfried! The only thing that can make this any better is for it to be screened in 4D. See you in the summer.